He has been to an NHL training camp with five different teams: Dallas, Atlanta, the New York Rangers, Colorado and Washington. All five clubs sent him down to the minors before the start of the NHL regular season. Less than two weeks ago, Brian Fahey was the last defenseman cut from Washington’s training camp roster. The 29-year-old native of Des Plaines, Ill. got into four preseason games and acquitted himself well. With Mike Green and Tom Poti both ailing on the Washington blueline, the Caps have summoned Fahey from AHL Hershey. He made the trip with the team to Nashville on Friday afternoon and is set to finally make his NHL debut tonight at Bridgestone Arena against the Predators. This isn’t the first time that Fahey has had the sublime pleasure of being called up to an NHL club. Some 11 months ago, the Colorado Avalanche recalled Fahey from its AHL Lake Erie farm club. Fahey spent 16 days in the NHL, practicing and traveling with the Avs, drawing an NHL paycheck and collecting an NHL per diem. What he didn’t do was play in an NHL game. Fahey was a healthy scratch for all nine games in which he was listed on Colorado’s playing roster. It’s hard to fathom how difficult that must have been. After seven years as a pro, to be that close to having your NHL dream come true – nine times – only to be sent back to Lake Erie more than two weeks later. 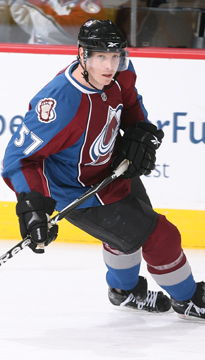 Caps winger Matt Hendricks was with Colorado while Fahey was with the Avs last season, and Hendricks himself did not make his NHL debut until he was 27 years of age. Three of Fahey’s four pre-season games were on the road this fall, so the Verizon Center faithful didn’t get to see much of him. He’s a solidly built (6-foot-1, 218 pounds), right-handed shooting blueliner who was steady in his own end and involved in the attack. He has spent the last four full seasons in the AHL, averaging 10 goals, 29 points and 92 penalty minutes during that time. Washington signed him on July 7 of this year, a transaction that was barely noticed in the District. 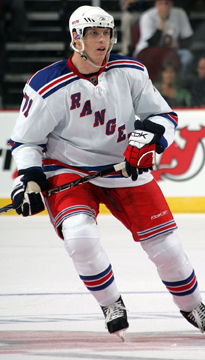 Fahey was Colorado’s fourth-round (119th overall) pick in the 2000 NHL Entry Draft. He played for the U.S. National Development Team for two seasons and then played four years of collegiate hockey at Wisconsin. You would think that a guy with his fourth-round pedigree and solid résumé would have gotten at least a sniff in the NHL by now. “I don’t want to say ‘surprised,’” says Fahey when asked if he thought he would have played in the league by now. “I would have hoped that by now I would have had a few, but it hasn’t been in the cards, for whatever reason. It hasn’t worked out and so each year I’ve pushed that I have more to improve and it makes me hungry. Fahey played a dozen games in Hershey back in 2003-04, when the Bears were still a Colorado farm club. He has also made the “Boardwalk Empire” circuit, playing in the ECHL in Atlantic City – under current Bears coach Mark French – and in Chicago, near where he grew up. In the third of his pre-season games with Washington, Fahey led all Caps’ skaters in ice time, logging 22 minutes in a 4-1 Caps win at Boston. He admitted to being somewhat surprised afterwards. “I was actually, a little bit,” he says. “I knew during the course of the game I was getting a lot of ice time in terms of power play and stuff like that. I guess I just didn’t realize how much time I had logged until after when I looked at the sheet. But that’s good. For logging that kind of ice time early in the season, I felt pretty good after the game. That’s a positive. I’m used to logging that kind of time down in the American League, so that’s not a shocker. It felt good and to get that kind of time up here is always a positive. Fahey majored in economics at Wisconsin. Now in his eighth season as a pro, he hopes to put off the use of that degree for as long as possible. For now, he’s enjoying the ride, the culmination of a journey that began a long time ago. Fahey’s wife and parents will be in attendance at Bridgestone Arena here in Nashville tonight. “I know they’re looking forward to me getting my opportunity to play in the NHL and I’m looking forward to having some fun,” says Fahey.